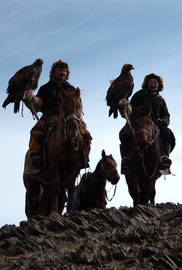 Two footloose addicts of Central Asia and Alpamys, a young nomadic Mongol-Kazakh eagle hunter, venture on horseback in to the wild and windswept steppes of Western Mongolia. Matt and Jamie, two footloose addicts of Central Asia and Alpamys, a young nomadic Mongol-Kazakh eagle hunter venture on horseback in to the wild and windswept steppes of Western Mongolia. Both totally clueless about how to ride a horse, the aim for their mini Mongolian odyssey is to learn the essential skills in long distance equestrian travel which they later hope to use for an 1100km crossing of Eastern Kazakhstan on horseback the following year. If you have a lust for the near-mystical lands where eagle hunters and nomads dwell, the light-hearted and lively ‘Wild Steppe’ is one worth watching!